Buck Richardson and I recently joined the Northern Gulf Naturalists group for a weekend outing in the Mt Garnet area. 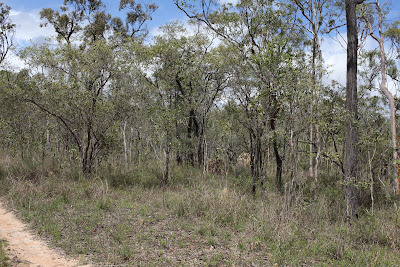 This is the "real" Australia-eucalypts, acacias and a variety of native shrubs and grasses. A wonderful habitat for all sorts of interesting organisms. 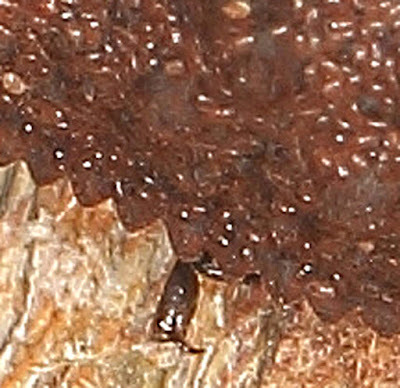 The ancient mounds of the termites-Nasutitermes sp are everywhere. 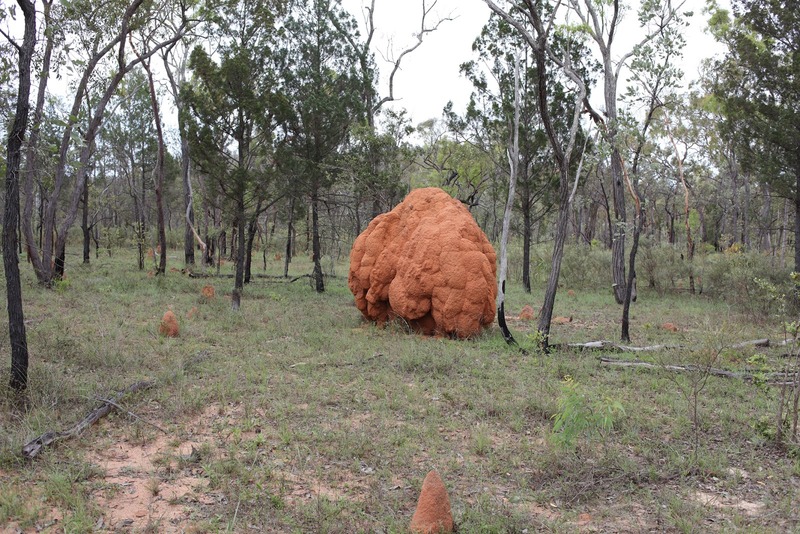 The smaller conical-shaped mounds are often taken over by ants of a variety of species. 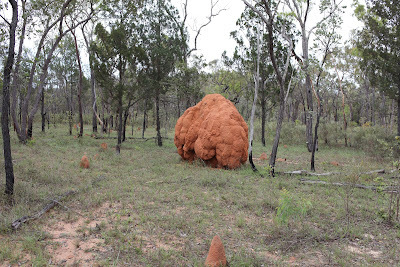 Insects and a wide range of other organisms use the mounds for shelter, food and reproduction. One curious inhabitant is this small beefly, family Bombyliidae. We find it at night on the big mounds almost wherever we go. Night walks provide information that might elude you if you only observe during the day. This mantid is member of the genus Ciulfina. 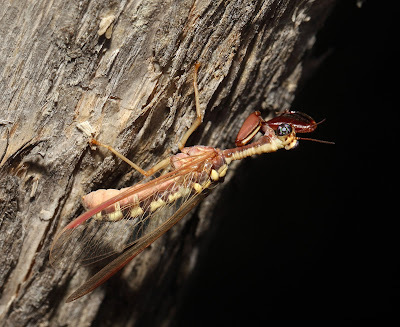 Ciulfina mantids are called "tree-runners" because they are usually observed during the day on tree trunks where they hawk small insects. They are extremely agile and have exceptional eyesight that helps them to elude capture. But after dark, they do something different. 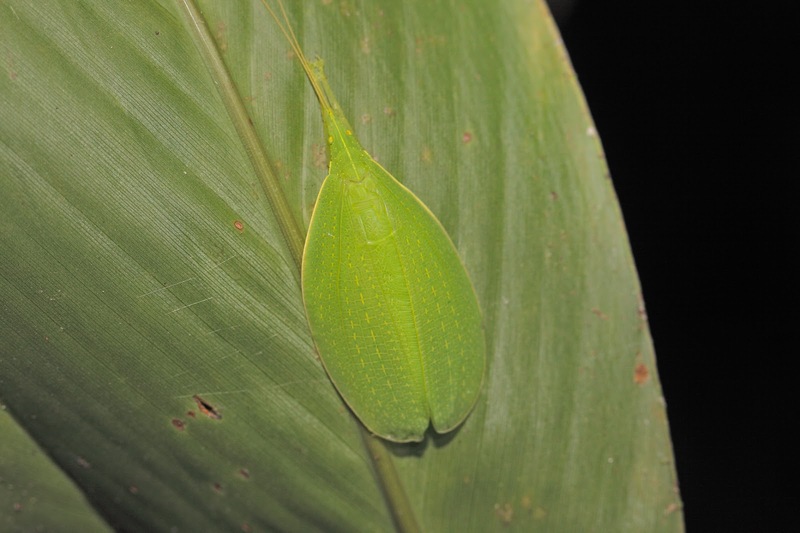 They leave the bole of the host tree and wander about on adjacent vegetation seeking other sites to occupy during the day. We have seen this repeatedly in many locations. During daylight hours they are never seen abroad like this one. Up close the sculptured, flanged and spiny head and thorax of this ground-running mantis in the genus Gyromantis is weird. 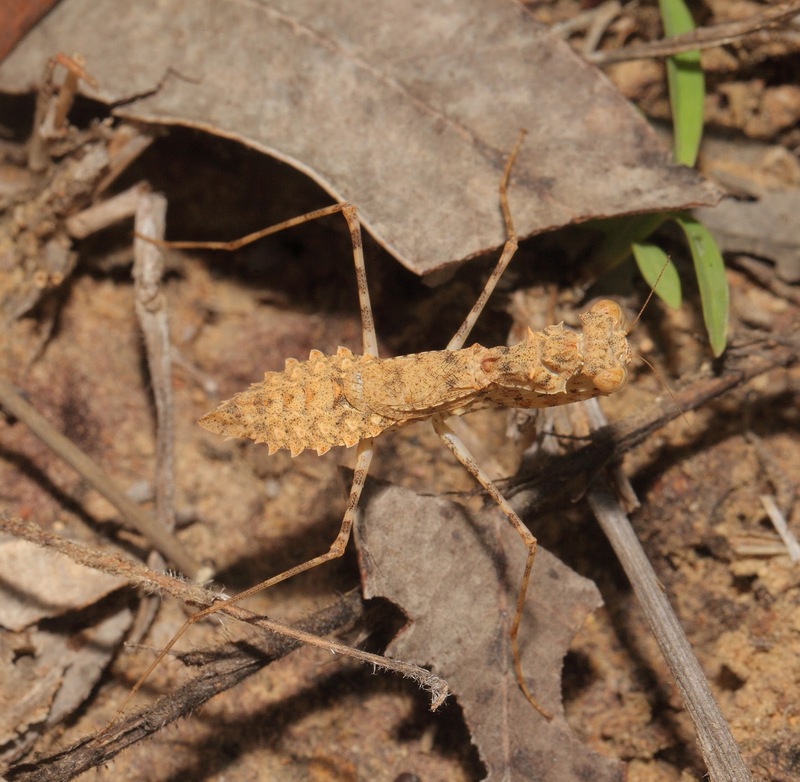 These little mantids run around on the ground hunting small insects. 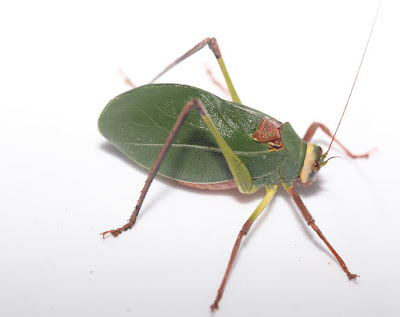 Females are short-winged and apparently cannot fly. 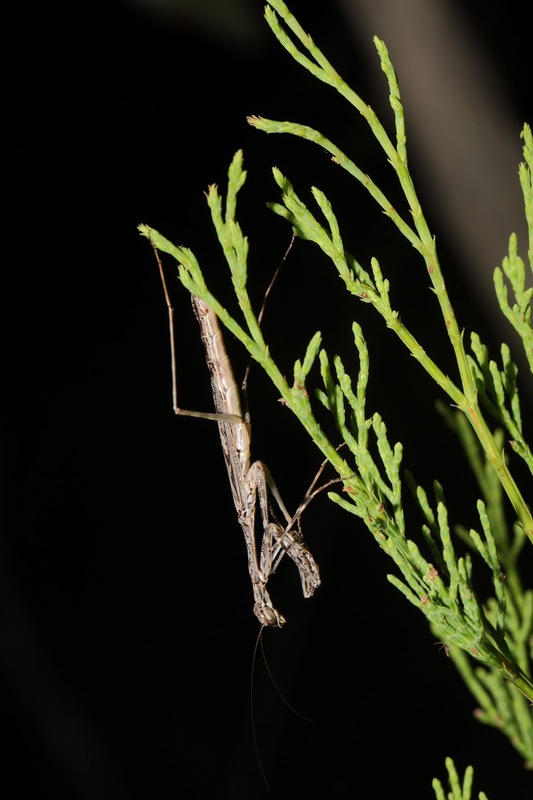 Males, on the other hand, are very slender and fully winged and are good flyers. They frequently show up on the light sheets. 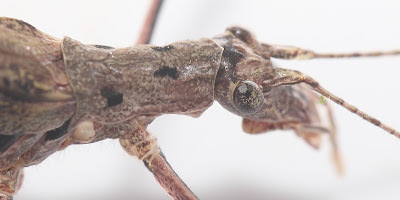 The genus Rhodomantis comprises a number of species all of which live on the ground and inhabit some of the driest parts of the country. They appear like sticks or twigs or grass stems. 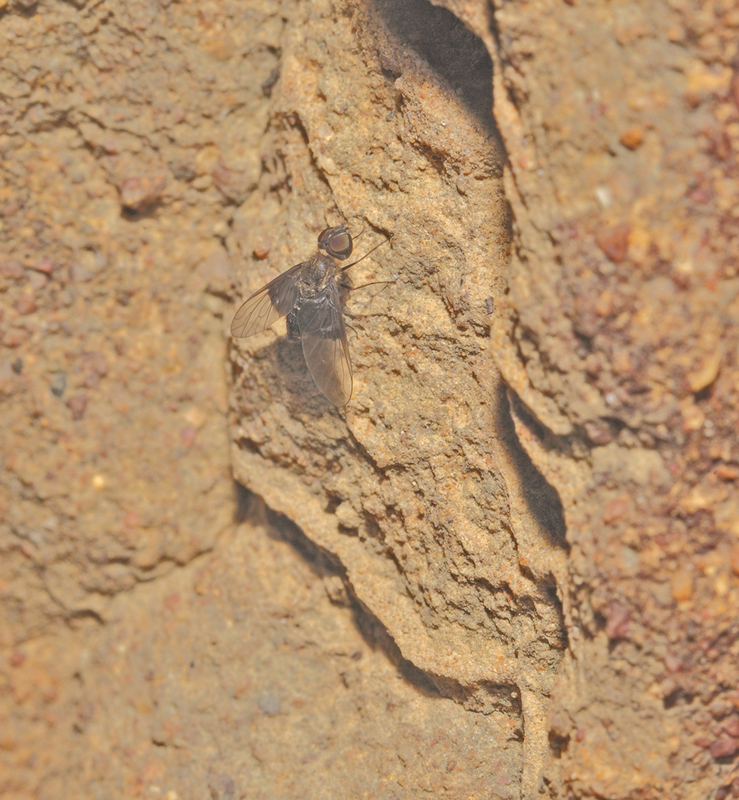 Females lay their eggs in the ground. Some species are flightless, others are fully winged. We found flightless females and this fully winged male at this site. We frequently encounter mantispids. 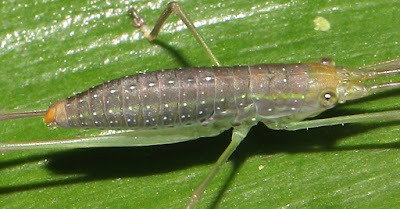 They look like mantids in the development of the forelegs and their posture. They use the forelegs in much the same way as do mantids. 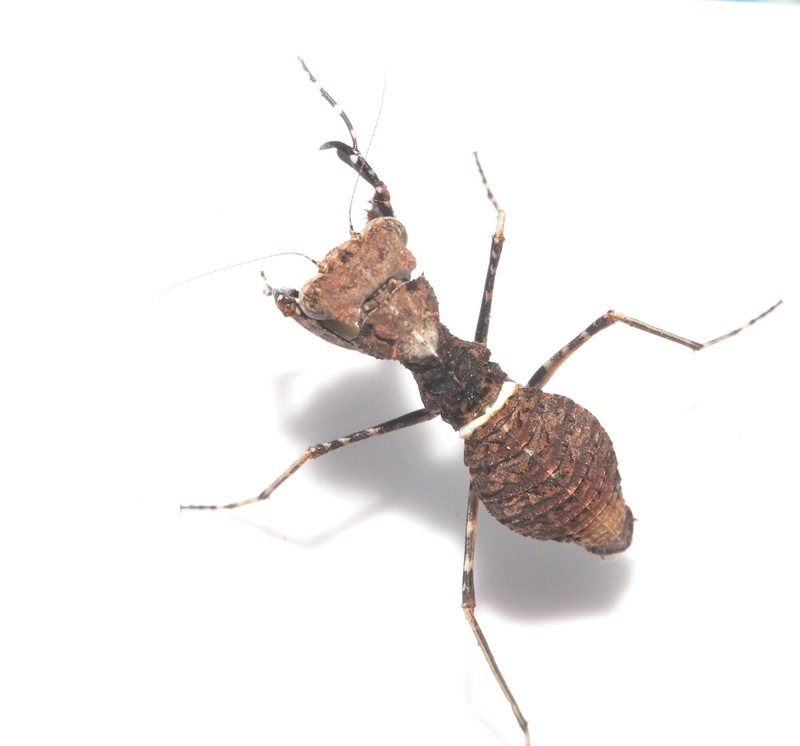 But they are completely unrelated to mantids. 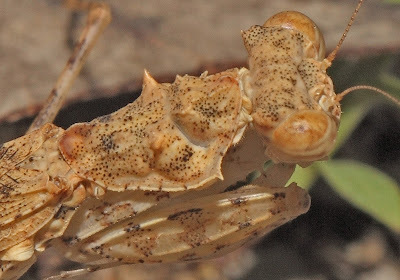 The undergo a complete metamorphosis and are members of the insect order Neuroptera. 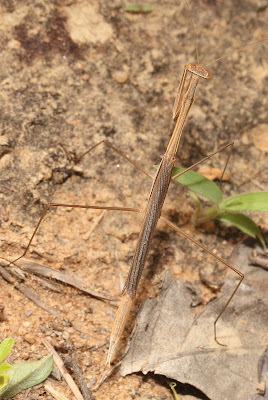 Mantids are orthopteroid insects and undergo gradual metamorphosis. 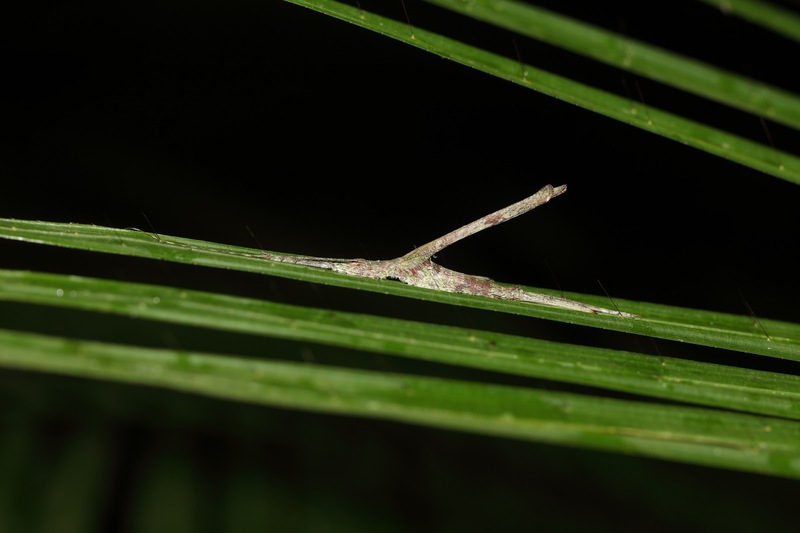 Mantispids go through an egg, larva and pupal stage before becoming adult. 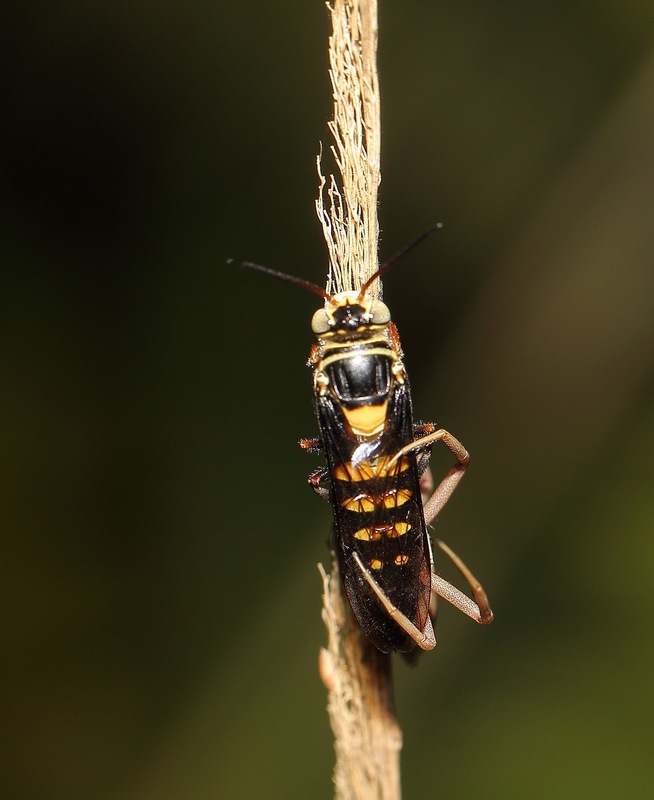 The larval stages of these insects are parasitises of beetles, bees, wasps and even spiders. 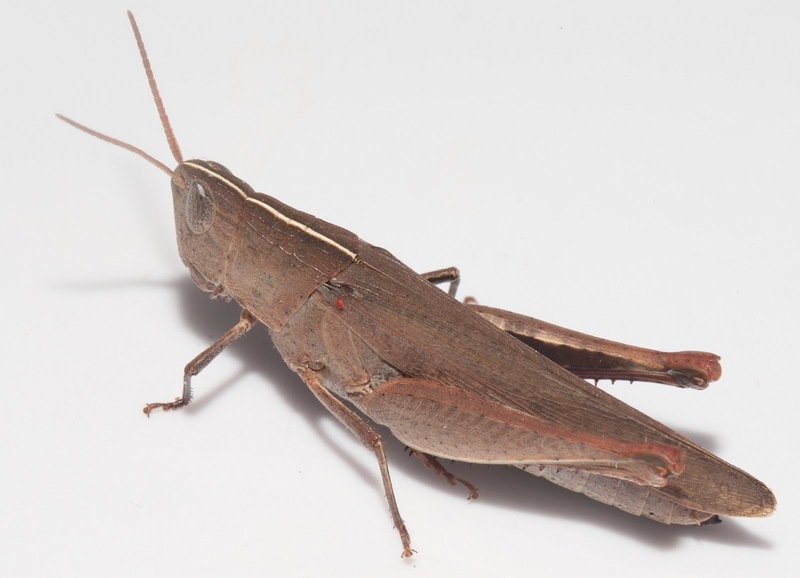 Spring and summer is a good time to look for grasshoppers in mixed woodlands. The above appears to be a species of Peakesia. This grasshopper is a female of possibly Goniaeoidea. The ubiquitous Common Bandwing, Pycnostictus seriatus Saussure occurs Australia-wide. 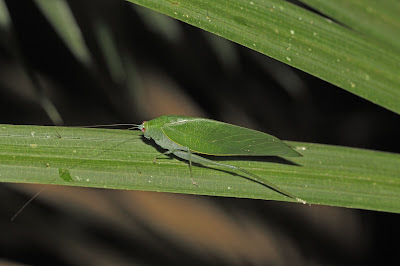 Goniaea furcifera (Walker) is called the Tropical Gumleaf Grasshopper and is fairly common where it occurs. 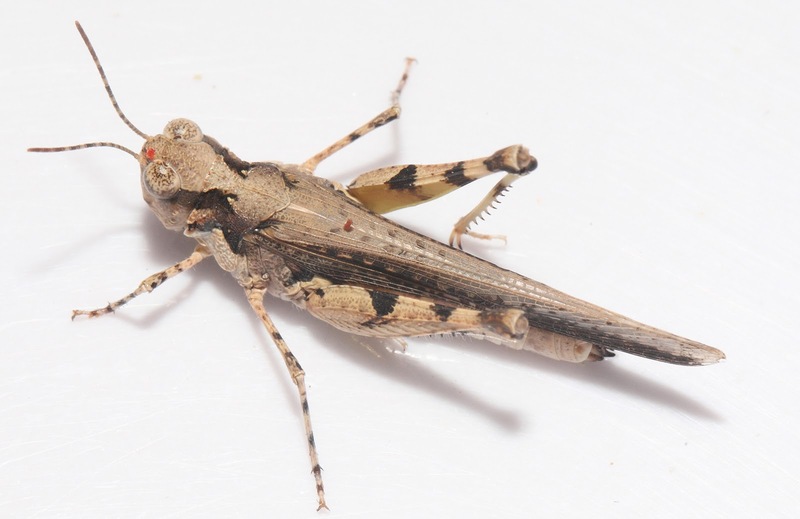 The last two grasshoppers were a bit of a puzzle. At first they appeared to be male (top) and female (below) of the same species, but at present I think we have Gen Nov 15, sp 3 for the male and Macrazelota sp. 2 for the female. Further checking is needed to confirm the identity of these two. 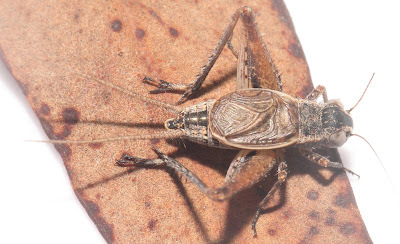 One major purpose for the trip to the bush was to obtain additional photos for the Guidebook to Australian Crickets which is being prepared. 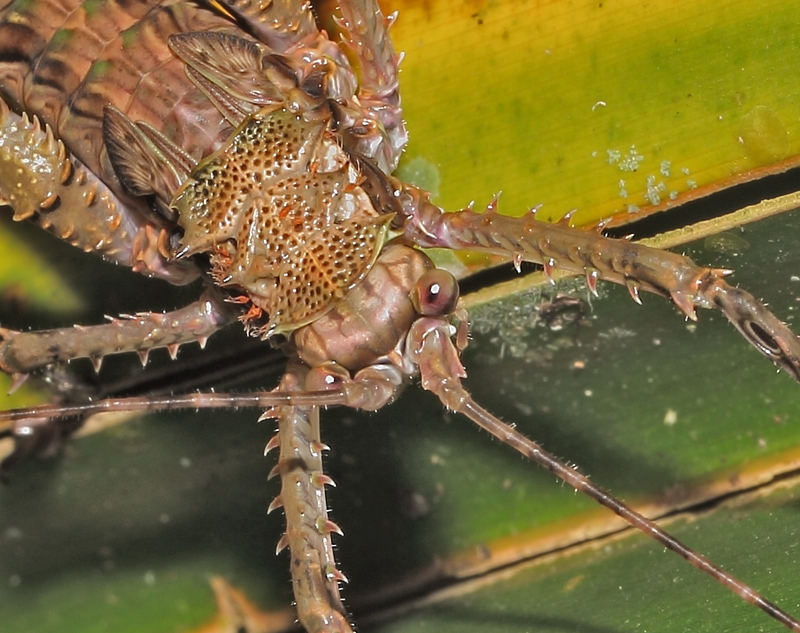 With over 400 described species and at least that many unnamed ones, the task is not easy. 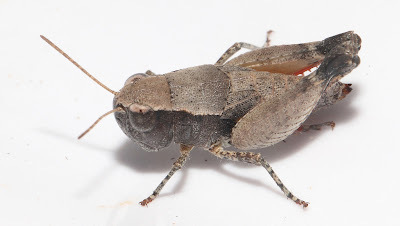 This coupled with the fact that most crickets are secretive and require a great deal of patience and stealth to find them. 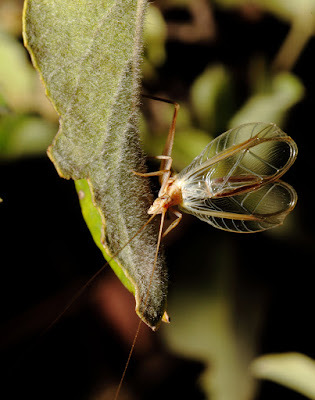 As a result the general photographer does not encounter these insects very often. Tree Crickets are not so difficult to locate and approach. This is Oecanthus rufescens, a common species throughout the country where it lives in grassy habitats. Males sing from perches usually within 1.5 m of the ground and are easily approached because they do not react to disturbance in their habitat. They sing for a while at one place and then move off to other sites en masse. 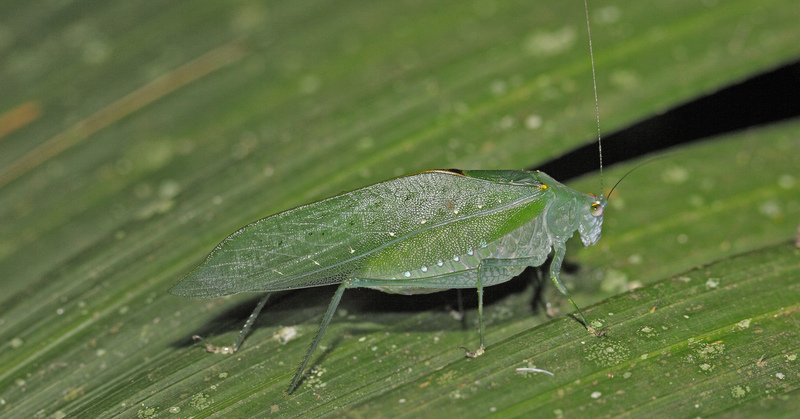 This species is easily recognised by the dark brown stripe on the male's forewing. 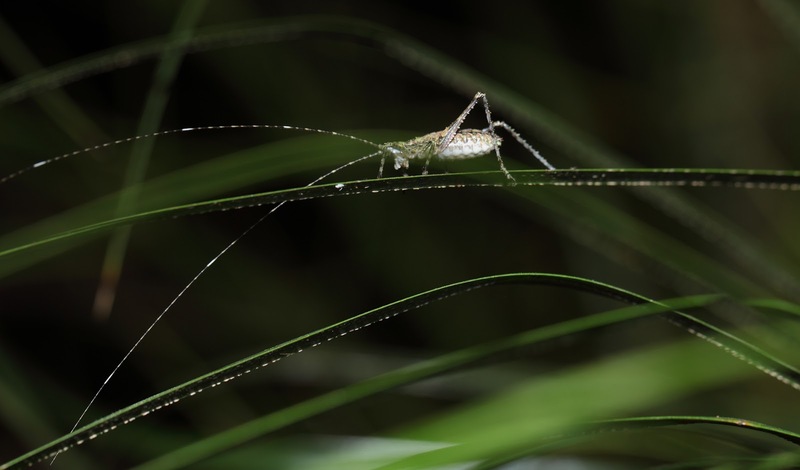 Adult Tree Crickets feed on pollen and the particulate matter they find on grass leaves and stems. As nymphs they consume small insects as well. 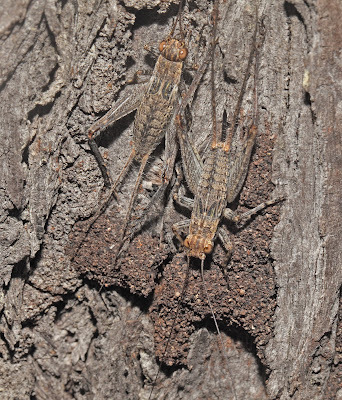 On a deeply furrowed and old eucalypt we found a group of cricket nymphs residing during the day in the cracks of the bark. They were remarkably protectively-coloured. 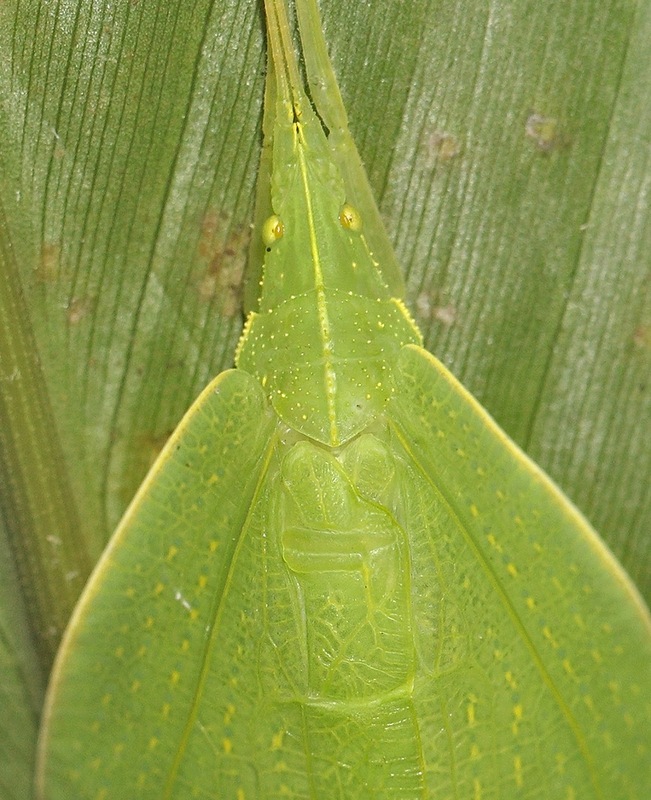 These are last instars. That is, the next moult will reveal the adult. A bit of searching provided an adult cricket. It turns out to be Myara wintrena Otte and Alexander. This is a fairly widespread species in tropical north Queensland where adults can be found in small trees and shrubs. Late in the season, females venture to the ground where they lay eggs. The nymphs spend several moults in leaf litter eventually graduating to trees where they live in bark cracks or under loose bark. Adult males commence singing in late afternoon and this continues until mid-evening when their acoustic activity ceases. 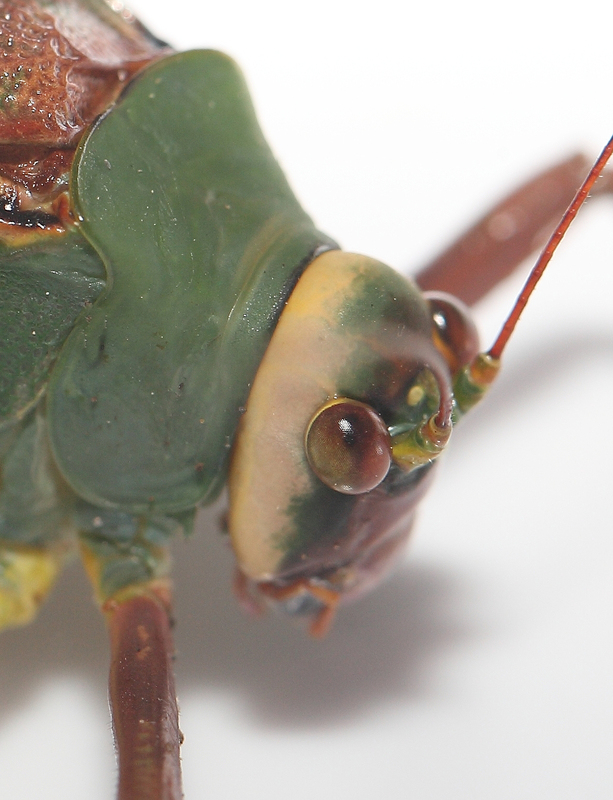 Myara wintrena is a colourful cricket that has seldom been seen or photographed. Yet it is very common where it occurs. 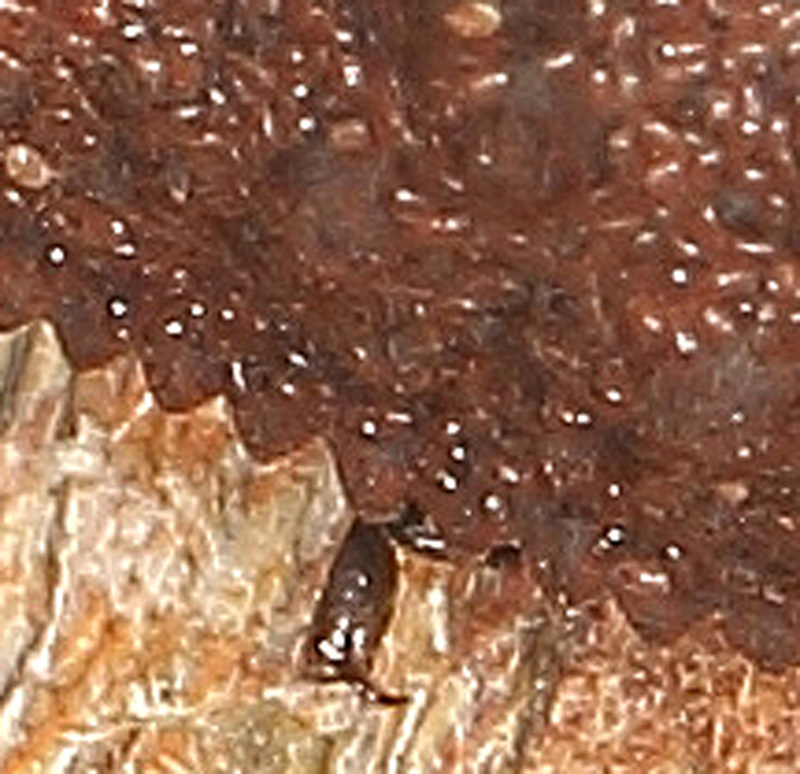 On the ground in leaf litter can be found members of the genus Salmanites. 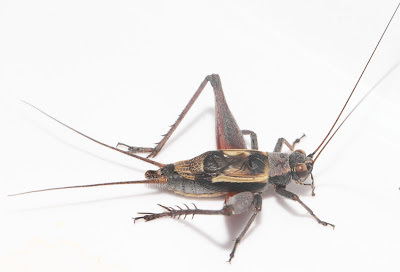 These crickets are small 6 mm or a bit larger) and are lightning-fast in their movements. They can be common but are extremely wary and difficult to approach and capture. Males are winged but cannot fly. The wings are used solely for sound production. Females are minutely winged or completely wingless depending upon the species. 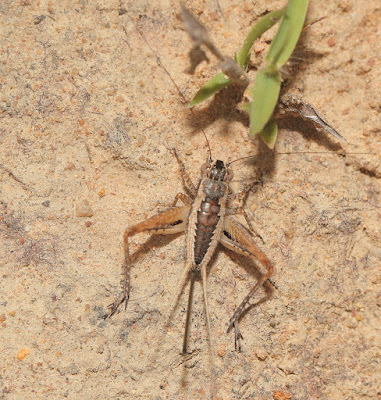 There are many Salmanites species in arid Australia and they are remarkable little crickets because they can withstand very high temperatures on the ground and require very little water. Male Salmanites commence calling in late afternoon and continue until just after dark. They are highly ventriloquial. That means they can sound like they are singing "here" but they are really over "there". They can be frustrating to capture as they live on the ground in leaf litter and move swiftly through the anastomosing twigs and stems to escape. 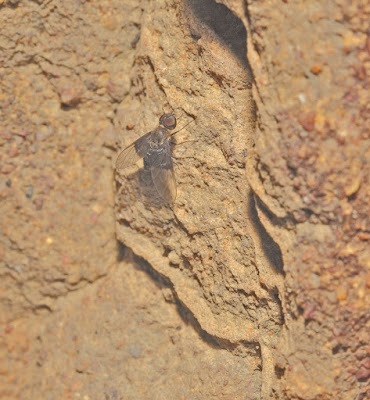 Salmanites sp, probably allaris, female. Note the long ovipositor. 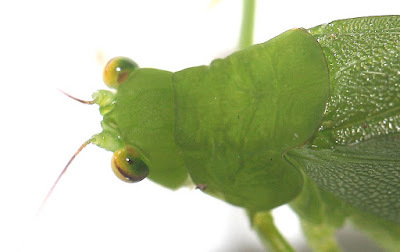 We conclude with a gorgeous little cricket called Pictorina kobarina Otte and Alexander. 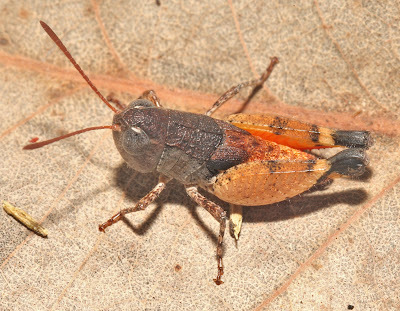 This cricket can be found along with species of Salmanites and nymphs of Myara but it is the least common of the three. 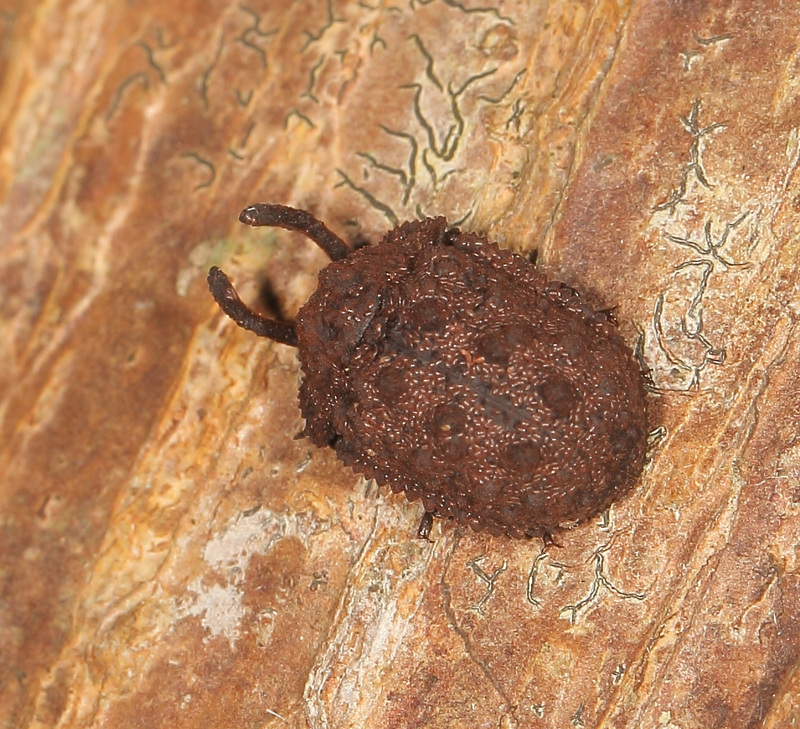 Males have a pleasant call that begins after dark, usually after the Salmanites cease their calling. We are lucky to have such a diverse insect fauna. 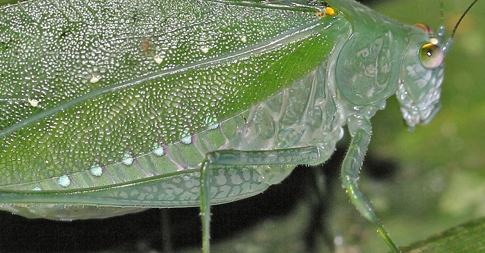 Next time we will document a synchronised emergence of two cicada species. While prowling around the bush recently I discovered this wasp asleep on a grass stem. A closer look revealed that the wasp would not survive the night. It had been discovered by a marauding spider. The spider appears to be a species of Oxyopes, perhaps rubicundus. This peculiar beetle showed up near the light sheet the other night. Even though we have had a very dry winter, insects have been developing. 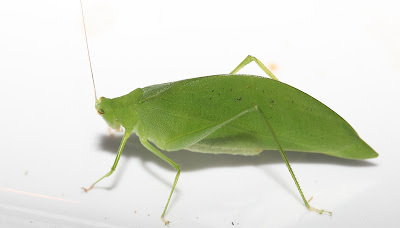 All of these katydids hatched from eggs during winter and are now adult. We have a nice variety in the rainforest in Kuranda. The three chicks are developing nicely but oddly two of them seem to be continually fighting with one another. This started some weeks ago and continues to this day. Both male and female cassowaries visit together and the chicks interact with both parents but the male gives way and is extremely cautious around the female. 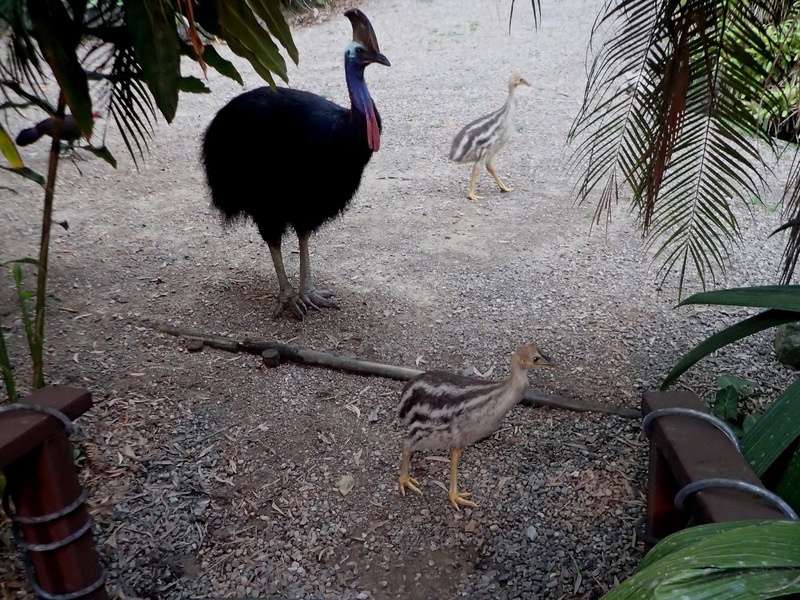 Sunday is World Cassowary Day. 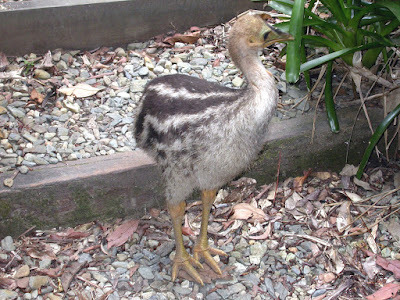 Interesting because Cassowaries occur only in northeastern Australia and New Guinea. 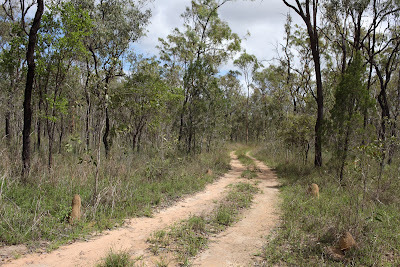 Most visitors to the Cairns region either don't know what they are and/or have never seen one. They are always impressed by both the beauty and size of the birds. Mrs Cassowary stopped by and just stood in one spot for about 10 minutes before disappearing into the forest. Individual birds can be recognised by a number of features. The shape and condition of the casque as well as the shape of the wattles often helps. With this gal, the middle toe of the left foot seems swollen compared to the right. Cassowaries are under threat mainly from habitat destruction but also from incidents with cars and trucks and depredations from feral animals such as dogs and pigs.